Recently I got another bunch of books to read from Packt Publishing, here’s the first one. 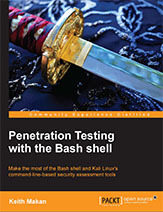 It’s a very nice, but brief book for those who are not used to the a Linux shell, but familiar with IT security techniques. I feel that the chapters on security are too brief, they don’t explain the techniques enough. However, the Bash introduction is very well explained and I can recommend it for everyone who want to try the shell out for the first time.